Eye On Sports Media: Reader E-Mail: Has Westwood One Dumped Bob Trumpy From NFL Games? 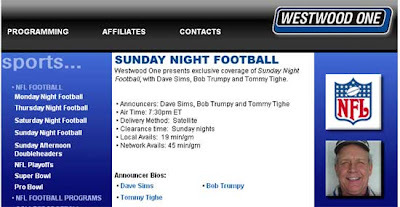 Reader E-Mail: Has Westwood One Dumped Bob Trumpy From NFL Games? As one of those peculiar fans who enjoys hearing sporting events on the radio at least equally with watching, do you know why Bob Trumpy has been removed from the 2008 Westwood One broadcasting assignments? Our announcer lineup can be seen on the press release that I sent out on Monday. I have attached it for your convenience. Again a totally useless answer, as it was the press release and your email that drove the question. So we do not know if Trumpy retired on his own or was let go, and unless he comes out and says why, we may noever know the real answer. At 63 years old, Trumpy worked for Westwood One from 2000-2004 and 2006 though last season. So whatever the reason, we wish Trumpy well in the future.